GOLDBERG: Your wife makes a very nice cup of tea, Mr Boles, you know that? PETEY: Yes, she does sometimes. Sometimes she forgets. MEG: Is he coming down? GOLDBERG: Down? Of course he’s coming down. On a lovely sunny day like this he shouldn’t come down? He’ll be up and about in next to no time. And what a breakfast he’s going to get. By the end of the 1960s Harold Pinter was building an impressive record of film screenplays, including his collaborations with Joseph Losey (The Servant in 1963 and Accident in 1967), the Pumpkin Eater (1964) and The Quiller Memorandum (1966). Now already ten years old, his first full length play The Birthday Party was finally made for the cinema in 1968. It starred Robert Shaw as Stanley Webber. 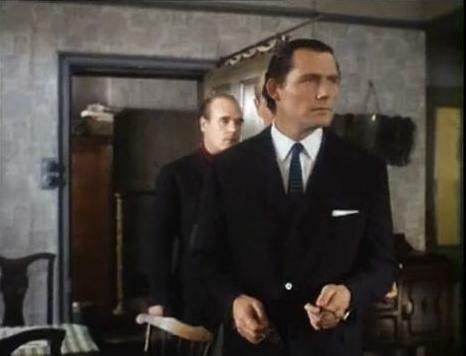 Shaw also appeared previously in The Caretaker (1963) making him perhaps the definitive interpreter of Pinter on film. The Birthday Party has an interesting pedigree. It is directed by William Friedkin, who was later responsible for The French Connection and The Exorcist. Both of these energetic films are a stark contrast to what is essentially a faithful record of a claustrophobic stage experience. 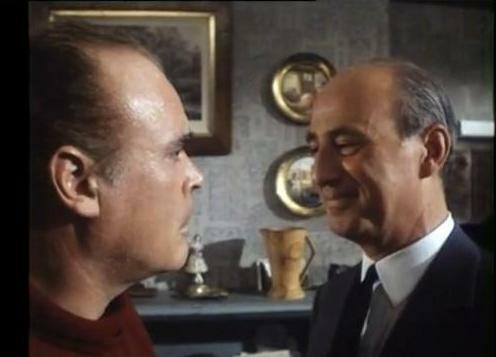 The film’s producers Milton Subotsky and Max Rosenburg were responsible for the run of first class horror films made by Amicus films in the sixties and seventies. The roles of Friedkin, Subotsky and Rosenburg are quite fitting; The Birthday Party is essentially a horror story. The cast also includes Dandy Nicholls (from Till Death Us Do Part) as Meg Bowes, landlady of the sorriest of seaside boarding houses. 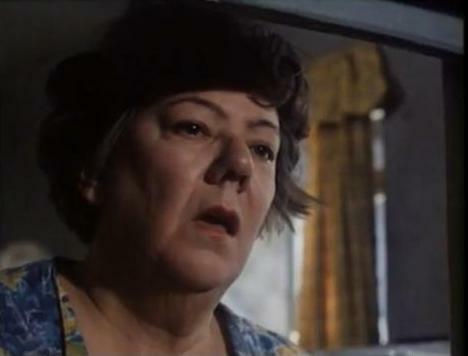 She is superb, as are Sydney Tafler and Patrick Magee as Goldberg and McCann, the most menacing of house guests. Moultree Kelsall as Petey and Helen Fraser (Bad Girls) as Lulu complete the line up, and for anyone familiar with the play this is a very faithful version. There is a timeless quality about The Birthday Party, and whilst Friedkin’s direction (though mostly restrained) reveals some 60s indulgences (most notably in the opening sequence with the camera moving in on the wing mirror of Goldberg and McCann’s car and the backing soundtrack of ripping paper) Pinter’s dialogue does not date. STANLEY: I had a unique touch. Absolutely unique. They came up to me. They came up to me and said they were grateful. Champagne we had that night, the lot. My father nearly came down to hear me…. But I don’t think he could make it. No, I-I lost the address, that was it. Yes. Lower Edmonton. Robert Shaw, an actor probably now best remembered for Jaws and his stint as a Bond villain, portrays this introspection perfectly. 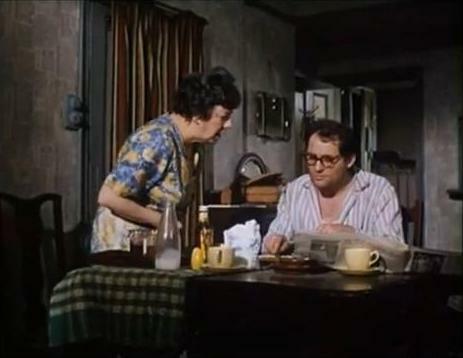 GOLDBERG: When I was an apprentice …my uncle Barney used to take me to the seaside, regular as clockwork. Brighton, Canvey Island, Rottingdean…we’d have a little paddle, we’d watch the tide coming in, going out, the sun coming down – golden days, believe me. A stable past is personified by the kindly Uncle Barney, who Goldberg proceeds to describe as a well respected “impeccable dresser. One of the old school.” A pattern is very clear: the importance of place names that connect with memories, a figure from the past worthy of respect and admiration, usually the suggestion of a rose-tinted past, the faded “golden days”. If insecurity of the present needs such constant reinforcement, then the uncertain atmosphere prevalent in The Birthday Party unquestionably highlights this. Even Goldberg and McCann, Stanley’s interrogators, virtual torturers and eventual abductors, have their moments of uncertainty. Of all British cinema of the sixties, this film is the least assured of the supposedly bright decade. Overlong but otherwise satisfactory film record of an entertaining if infuriating play, first of the black absurdities which proliferated in the sixties to general disadvantage, presenting structure without plot and intelligence without meaning. By 1968 Halliwell’s perceived golden age of cinema had already ended. Oddly, like the characters in The Birthday Party, he was stuck in the past. In 1975 Harold Pinter met Antonia Fraser. They were both in their mid forties and both in long term marriages; Fraser to a Conservative MP and Pinter to the actress Vivien Merchant. Must You Go is an account, mostly gathered from Fraser’s diaries, of more than thirty happy years they spent together. For any reader interested in Pinter the artist, I wouldn’t hesitate to recommend Michael Billington’s excellent biography instead, but this is nevertheless a very good at at times very moving book. Unlike Billington’s portrait, which drew attention for revealing Pinter’s long affair with Joan Bakewell, Must You Go doesn’t set out to spill any beans on the great man. In fact we can only really gather things from what is left out of the story, for example the abandonment and eventual decline of Merchant and Pinter’s estrangement from his son. Neither receive too much attention here, with Fraser keeping her distance from the people he chose to leave behind. There’s more emphasis on his lifelong friendships, which included Robert Shaw, Simon Gray and Samuel Beckett, and his new extended family (Fraser had six children from her first marriage). It could also be argued that by the time Pinter had met Fraser he had already made his most artistic achievements, with his best works The Birthday Party, The Caretaker and The Homecoming already established as masterpieces. Perhaps happiness dulled his creative edge, and although he continued writing (Betrayal appeared in the early 80s) he did increasingly concentrate on poetry. And as the years march on, Pinter’s passion for politics begins to take prominence. Much of the book chronicles ugly moments in history; IRA bombs in London, The Rushdie affair (Salman Rushdie visits the Pinters under armed protection at the height of the Fatwa) and the Iraq war. Fraser is frank about their own shifting politics; Pinter voted conservative in 1979, SDP in a subsequent election and then finally Labour. In 1982, surprisingly, he supported the Falklands War. Must You Go alludes to Antonia Fraser and Harold Pinter’s very first meeting, and these are the first words he ever said to her. The phrase echoes through the book right until the end, and the closing diary entries recall an increasingly frail Pinter and he battled cancer. It’s a very intimate portrait of a fascinating man who enjoyed life as much as he could. In 2007, very sick, he appeared onstage for a short run in Beckett’s Krapp’s Last Tape, relishing again the joy of an actor that he had originally discovered at sixteen. Around the same time he accepted the Nobel Prize for literature, and enjoyed a revival of The Birthday Party. Busy until the end, his inevitable passing in 2008 was still a shock. Anyone who’s ever studied modern drama will recognise these distinctive blue Methuen editions. Looking through my books, I realise I have been unconsciously collecting them over the years. Harold Pinter and Joe Orton feature largely in my collection. 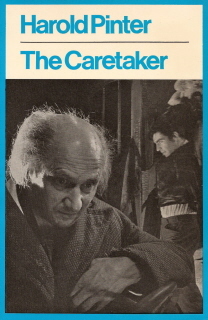 The Caretaker first made its presence known in 1960, and the cover here features Donald Pleasence as Davies and Alan Bates as Mick from the original production. The Methuen editions always feature a black and white photograph from the featured play, bordered by the recognisable blue frame. I particularly like this cover; Davies and Mick – both troubled, both potentially dangerous, both in their own way hopeless. They’re not facing eachother and that’s typical of the play- characters lost in their own little worlds of plans and dreams for the future. The image that stayed with me for a long time was of the open door to this room with the two men standing in different parts of the room doing different things … the tramp rooting around in a bag and the other man looking out of the window and simply not speaking … A kind of moment frozen in time that left a very strong impression. Although playing an old man, Donald Pleasence was only 41 in 1960, and he played the old tramp again in 1963 when the play was filmed with a cast that also included Alan Bates and Robert Shaw. In 1991, aged 72, Donald Pleasence returned to the London stage for the last time to revisit those crowded London rooms of The Caretaker. I was lucky enough to see a performance, and I am always pleased to report that Pleasence was still breathtaking in the role.